I mean it, Granny…you have been warned! I have been congenitally cursed with a bloodhound-like nose. I can detect and identify even the faintest of aromas. This is unfortunate when I am faced with an odor that I would like to avoid, but will be GREAT when my kids are old enough to try to sneak back into the house under the influence of illicit substances. Between my nose and the watchful eye (and suspicious nature) of Hubby, the ex-cop, our kids won’t be able to get away with anything (at least that’s what we are deluding ourselves into believing). 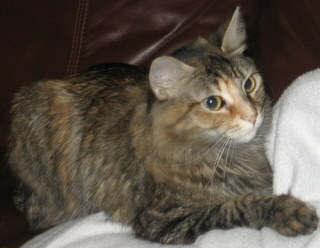 Queenie, the female cat out of our three, has always been a picky eater. She will eat the special “prescription” food from the vet, but we’ve never been able to find a cat “treat” that she likes (except for a little shred of “real” chicken, every once in a while, when I’m cooking or after we’re done eating). 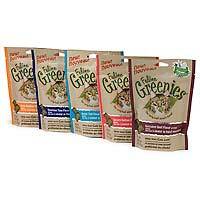 The boys like everything that we’ve ever given them, treat-wise, but this one (Greenies) has been their favorite up until now. The last time that I was at the vet (buying overpriced food), the assistant gave us some samples of this kind. Queenie LOVED them. Loved them so much that she will follow us around after we give her one, waiting for another. She is normally pretty aloof and indifferent, so this is a marked difference. She also tracked down (by scent) the open bag (the small sample pack didn’t have a closure, so I had just Scotch-taped it) on my desk and was trying to bite it open. The samples were of the “free range chicken” flavor, so I can’t vouch for the other flavors, but all three cats LOVE the chicken. It doesn’t actually contain free range chicken, mind you, but is free range chicken flavored. I find that hilarious. I know who they’re pandering to, and I realize that I probably am their target audience, but I still think it’s funny. Anyway, if you have a picky eater cat, give these a try. They are on sale on Petco’s website right now for two bucks (not sure if they are also on sale in the store). The cats are now toilet trained. Halle-freakin-lujah. Completely trained. No more liners, no more bowls, no more litter. They are using JUST the toilet. We have an automatic flushing device installed that even takes care of the flushing for them. And they’re not scared of it….anymore. I am SO proud and pleased, both of myself and of them. I figure, if I can train three cats, with very different habits, personalities and intelligence levels, to use the toilet…AT THE SAME TIME, I can do ANYTHING. It did take about 7 months, in all, due mostly to inconsistent technique on my part. It definitely went slower with 3 cats than it would have with just one, because we had to wait until ALL of them were ready before we could proceed into another “stage.” If it had been up to Jack, the training would have been done 6 months ago, but Queenie, on the other hand, probably would not have been trainable at all if it hadn’t been for the example that her brothers set. Anyway, we’re DONE. Also, be aware that you should not be afraid to use the toilet at our house: they are only using the toilet in the master bathroom. They may, someday, figure out that all toilets are the same and start using the others, too, but they definitely associate their toileting behavior with our bathroom, so it hasn’t happened yet. In any case, the toilet seat stays absolutely clean, anyway, because they are completely indoor cats that no longer scratch around in litter, so their feet are at least as clean as my floors (since that’s all they walk on). Disclaimer: some days, my floors are in better shape than others. 🙂 In any case, they are not using any bathroom that guests are likely to use, ever. I will take some new videos and post them soon, for anyone that is interested. High-fives and back-slaps all around! I recently installed software on my website that allows me to monitor incoming traffic to my blog. Don’t worry: I can’t tell exactly who is looking at what or where they’re located, it just tells me what sort of search terms people enter to be able to find my site – so feel free to email the link of my cats on the toilet to all of your friends, inserting comments about what a loon I am. To make a substitute for 1 cup of brown sugar, if you don’t have any on hand, you can use 1 cup of granulated white sugar whisked together with 1 to 2 Tbsp of molasses. If you’re planning to decorate the cookies with just sprinkled sugar or jimmies, then you should sprinkle them BEFORE baking the cookies, but if you’re going to use icing, then you should bake them first, and THEN ice them and THEN add the sprinkles. This must not be as obvious as I would have thought it would be. This is why the order is important: if you try to sprinkle the sugar/jimmies on AFTER the baking , they won’t stick. There you have it. Mexican vanilla used to contain something called “coumarin” which is a blood thinner (and rat poison ingredient). Mexican vanilla was not imported to the US because our FDA regulations (understandably) would not allow this ingredient. Most Mexican vanillas have been reformulated and have labels that say “coumarin free” and are perfectly safe. Line a baking sheet with waxed paper. Lay the gnocchi on the pan in a single layer, without allowing the pieces to touch. Place the baking sheet in the freezer (gently cover with plastic wrap, if you’d like) and leave it there until the gnocchi are frozen solid (overnight?). When they’re completely individually frozen, remove them from the baking sheet and place them in a large, Ziploc freezer bag. To cook them later, just place them carefully directly into boiling water and cook them until they float. Remove them from the water with a strainer and sauce as desired. Umm….why? But, if you’re determined to avoid alcohol, Kahlua is a coffee liqueur, so, again, I would think that a reasonable alcohol-free substitute would be pretty apparent. Suffice it to say that I think your local Starbucks should be able to help you out. I think what you’re looking for is a bakery. You should be able to buy a single sugar cookie there without incident. Actually, your local Starbucks should be able to help you with this one, too. No. It has been pasteurized and is perfectly safe, but you should treat it carefully once it is reconstituted to prevent spoilage or contamination. I haven’t the foggiest, but if you figure this out, please let me know. It sounds like you could win some sort of Physics award. With a fork. And a napkin. If they’re whining “Moooooooom, I’m huuuuuuuungry“, keep feeding. If their eyes are bugging out and they’re clutching their stomach, stop. I’ll have to have Hubby address this issue: I’ll have him give some tips and techniques in a future post. Yes, especially if you want to ensure that they sleep through the night. 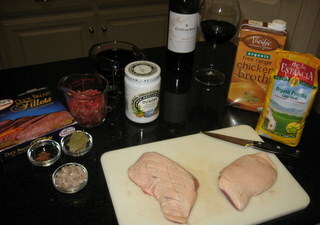 Just kidding – any alcohol content is usually cooked out as the sauce cooks. There may be a trace amount – like what would be in vanilla extract. Cypress Grove Humboldt Fog. I’m free tomorrow night. For the same reason that water is hard to pour when it gets below 32 degrees. You are aware that “ouch” isn’t an actual medical term? I’m hope that I’m missing something here, but I’m getting a mental image of one of those things that you fill with cat food that it doles out bit by bit when you’re going aware for the weekend, but filled with Goldfish or Cheerios or something. OK, now I’m fighting off a mental image of some guy trying to scrub dishes with an Oreo or trying to rub a gingersnap on his armpits or trying to convince his girlfriend to eat a few prophylactic, pre-coital Fig Newtons. Apparently, our bed was a much more appealing toilet than the water-filled bowl and we when we adjourned to the bedroom night-before-last, we were met with a really disgusting sight and I was up a few more hours than I planned, doing the resulting laundry. That was fun. So, the cats are now quarantined in our bathroom, without access to anything appealing to eliminate in except for the toilet set-up. Don’t worry – our bathroom is very large (we moved the piano in there during a recent remodel, so that the kids could still practice) and their food and water are in there; they’ll be fine. I’ve been wanting to try this whole toilet-training thing for a long time and this was precisely my fear: that two of them would take to it beautifully and there would be one holdout (I even predicted which one it would be) that wouldn’t figure it out and would require a litterbox. If we have a litterbox in the house, of course, the other two will want to use that, as well, and will no longer opt for the toilet. So, if Miss Priss doesn’t get the hang of this soon, we’re back at Square 1. Dinner was also a dismal failure last night. I made (attempted? botched?) this Cooking Light recipe and it was AWFUL. I think that it was more of an execution error on my part than a true recipe defect, but it was definitely a team effort. The duck didn’t have much flavor on its own (was just sprinkled with salt and pepper) and the sauce really wasn’t distinguishable from a regular wine reduction. I expected some more flavor payoff from the semi-exotic ingredients (who keeps rhubarb around? ginger preserves? 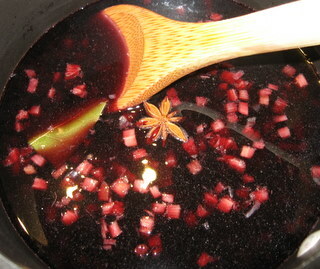 star anise? ), but they just didn’t add much punch to the sauce. I seared the duck beautifully on the outside and the skin was beautifully crispy, but I could tell that it was still undercooked in the middle, so I tried to pop it into the microwave (Gross – I know, I know, but desperate times call for desperate measures…) for just a few seconds to catch the middle up with the lovely outside, and of course, I turned it into a chewy, overcooked, rubbery, disgusting mess. 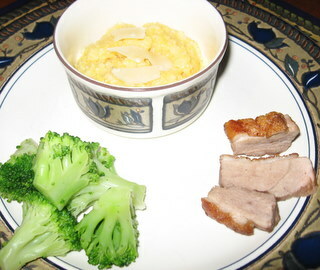 The polenta was fine, but I added a little parmesan to it, which didn’t complement the sweet-ish sauce at all. Kid’s plate, with shaved parmesan on the polenta. The broccoli (frozen, but organic) was the best thing on the plate. 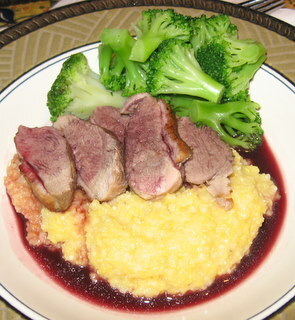 It was a pretty plate (except for the gray-colored duck), but it tasted dreadful. The cats using the TOILET we expected, but not the toilet PAPER! If you want to try this whole toilet training this at your house, I would suggest taking the roll of toilet paper off of the dispenser to prevent this sort of thing. Also: some of you have expressed concern about dirty cat paws on our toilet seats, but here’s the deal: if they’re not scratching around in a stinky, nasty litter box, their paws won’t be dirty, right? And rest assured that MUCH hand washing goes on between the toilet training and the cooking! Author laraPosted on December 4, 2007 Categories Cats, MiscLeave a comment on The cats using the TOILET we expected, but not the toilet PAPER! 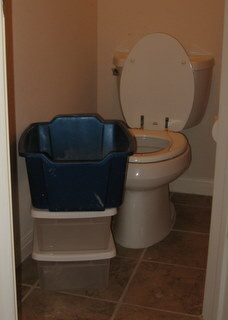 Step 1: Move the litter box as close to the toilet as possible. Place the toilet with the seat down, but the lid up. Step 2: Raise the litter box up a bit (on something sturdy, so the cat won’t be nervous if it gets wobbly. We used plastic storage boxes from Target). 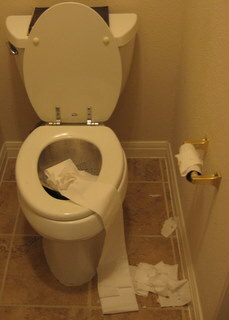 Keep the toilet in the seat down, lid up position. Step 3: Raise the litter box up a little more. Keep the toilet in the seat down, lid up position. 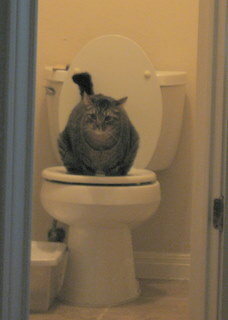 At this point, your cat may be jumping onto the toilet seat first and then jumping DOWN into the litter box. This is a good thing. 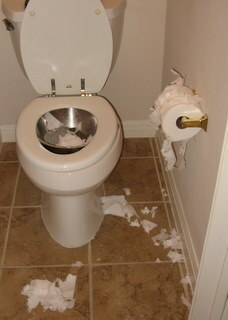 We had problems with our cats attacking the toilet paper at this point, so you might consider removing it. Step 4. 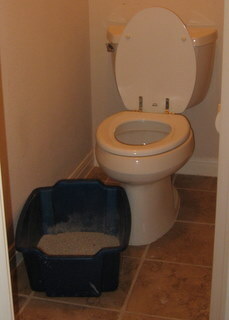 Place the litter box ON TOP of the toilet (your cat will figure out that he needs to jump up into it). You can leave a “stepstool” (like a plastic storage container) if you’re worried that your kitty won’t be able to make the jump in one step. 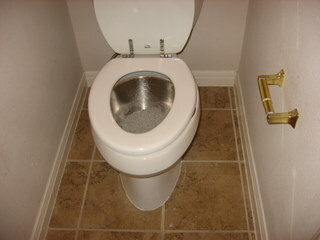 Step 5: Find a metal bowl that will fit inside the toilet and rest it inside. 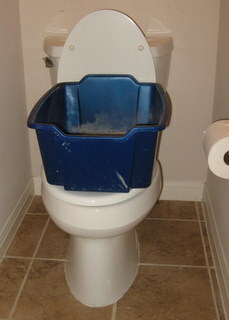 Close the seat over it (leave the lid up) and place a couple of inches of cat litter inside the bowl. 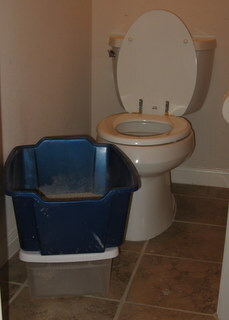 Step 6: As your cat/s uses the litter box/toilet/bowl device, scoop out the, umm, product and dispose of it. Don’t refill with fresh litter, but, instead, just allow the litter level in the bowl to gradually go down. The original instructions that I read said that you should try to gently catch your kitty “in the act” and move any paws that are not on the seat (but are, instead, in the bowl) as they are going (to encourage them to eventually “squat” with all four paws on the seat), but we’ve not been able to do that – our cats freak out when we approach them as they’re “going” and will jump down. I’m hoping that they will figure it out on their own when we reach the next step (gradually adding water to the bowl). 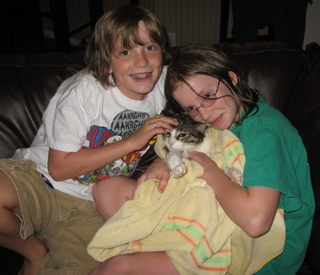 (This is the stage where we are with our cats right now, so I’ll leave off for now. Keep an eye out for Part 2 soon). We originally got this technique here (more info, less photos). I’ll give you fair warning here. 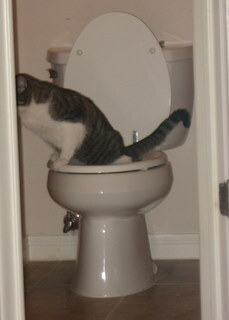 DO NOT scroll down if you are easily offended or don’t want to see photos of cats using the toilet. Really, this is your last chance to turn back….. I mean it – are you really sure you want to see these? Jack, looking VERY annoyed that his good ol’ litter box has been replaced by this odd thing that the FEEDER BEINGS use. Ace, taking care of business. 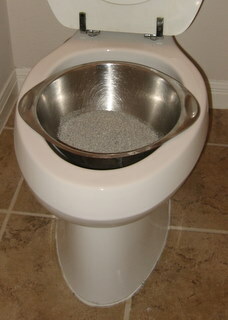 We are now at the “metal bowl in the toilet” stage and are lowering the litter level daily. I anticipate that sometime early next week, we will begin adding water to the bowl, instead of litter. I am BEYOND excited about this project and really hope that it works. I would LOVE to be permanently free of a litter box for these guys.